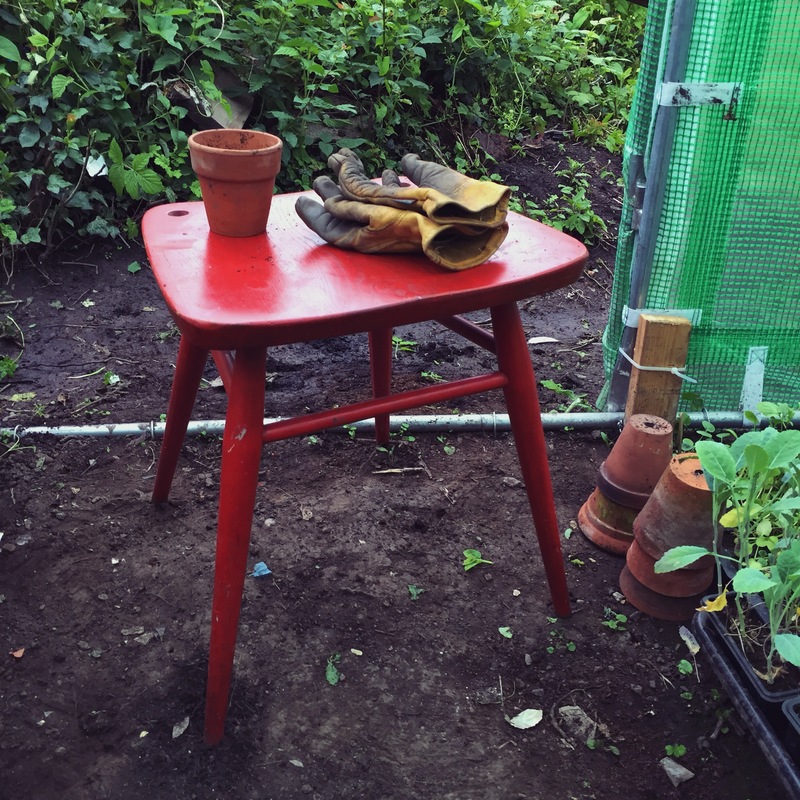 I have the cutest new stool for my polytunnel and best of all it was free! On my drive home a few nights ago I was going through the busy part of Hyson Green when I spotted a cute red stool by the road, next to some wheelie bins. You often see household objects on the pavement along that street so it was clear it wanted a new home. It’s the perfect height for potting on my tomatoes which will keep my busy over the next week or so. The question is, do I keep it red or paint it a different colour?! Eek. Time will tell. Oh I do love a good freebie! I treated myself to some new wellies yesterday..just look at them – they’re so gorgeous. I was on my lunch break and on my way into Loughborough town centre and I just spotted all the little foxes and could not resist! They were on sale too – PERFECT! Burnt some of the excess wood. Made pea canes and edging from excess wood. Planted autumn fruiting raspberry canes (Joan J variety). Erected additional shelving inside the greenhouse. Broke up the ground around the many plum suckers for the rain to help loosen. Broke up the ground to extend the main bed an additional 1-2 feet. Made a make-shift cloche to warm the soil. I don’t often splash a lot of cash into tools and materials for the allotment if I can go without. For over a year and a half I’ve had my plot but no proper wheelbarrow. I was left an old rusty one when I took on the plot. It had a hole in the bottom and was missing the tyre, so it was very cumbersome to move about. Instead I used a slim wheelie bin, also left by the previous tenant. But with the very rough terrain even this was difficult to move, but I made do. We’ll soon be rolling the clocks forward to British Summer Time which means longer days, warmer evenings and lots more lovely sunshine! Ok, so we loose an hour of sleep in bed but at least the clocks change over the Easter Bank holiday this year so I won’t be at work on the Monday -yipee! You can guess where I’ll be! Probably planting some potatoes no doubt. After such a dull, grey winter I never been so excited for the evening to be brighter. I don’t know about you, but being trapped indoors for too long makes me feel so grumpy and achey – I itch to be outside with the sun beaming down on my face. The longer days means I’ll be able to pop to the allotment after work, take evening strolls to the sound of the bird chorus, have BBQ’s as soon as it gets warmer, make the most of the glorious sunshine and enjoy the sweet smells that come with Spring and summer. I’ve been able to tick a few major things from the to-do list this week. One of which was to find and pick up some free manure. Not one of the nicest of jobs, but it needed to be done. My allotment soil isn’t particularly poor in quality in fact it’s very rich, to the point that my neighbour jealously shows everyone how dark it is. So I’m very grateful to have such fertile ground, but I know must look after and replenish the soil if I am to be rewarded with bumper crops later in the year. Last year I attempted to grow a couple of chilli plants from seed with little success. Reasons why? I started them too late and didn’t give them enough light and heat. Spring last year wasn’t particularly warm which didn’t help matters and even summer wasn’t hot for very long. Anyway. Lessons learnt (chillies won’t develop grow well in a shed, no matter how many windows it has) this year I’m growing chillies again but I hope to get their growing conditions right. A few weeks ago I picked up a mini greenhouse from Wilkinsons on offer for £25, as a temporary measure until I get a polytunnel – I’ll save that for a later post! The greenhouse isn’t up yet so and it’s still too cold out, so I started some seeds off in a propagator at home.